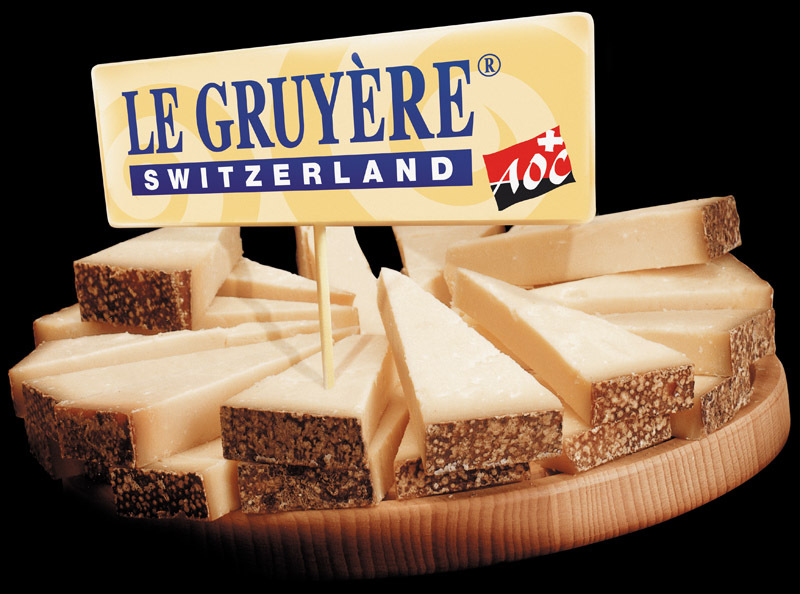 Gruyere is a cheese from Switzerland, in the region of canton of Fribourg. This cheese is from a cow, and has a mild, and not overpowering flavor. Its aging time is about 5-12 months and it is not pasturized. This yellow, hard cheese can be served with white wine, and many other dishes. Graded it can be served as a table cheese or on a salad or pasta, and it is also used in quiche. It is often used in baking, fondu, french onion soup, and cordon blue. Le fromage est doux. Le goût est crémeux et fait avec du lait de vache. Il est moisi, et les goûts de champignons. La texture est légère. Il est semblable à du fromage suisse. Il a aussi des saveurs de noisette et douce.